Back in 1995, as the economy recovered from the deep recession earlier that decade, we reached a ranking of 9th on the international league table of overseas aid donors measured by the share of gross national income devoted to overseas development assistance. 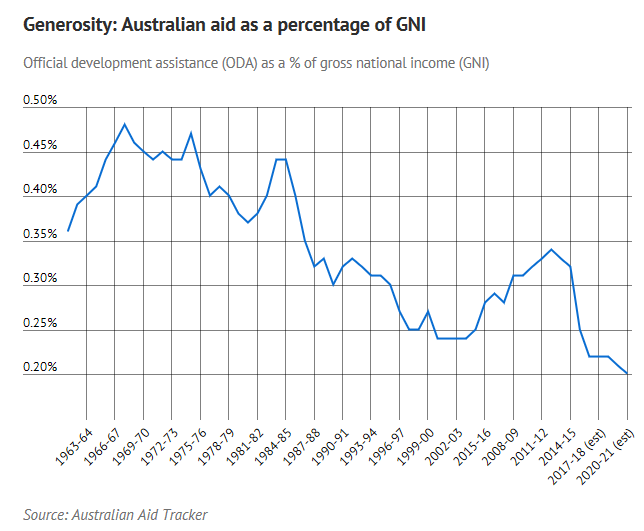 That year Australia contributed 34 cents for every $100 dollars of national income to help poorer nations. Now, after more than a quarter of a century of uninterrupted growth, we’ve slipped to 17th place on that donor ladder. 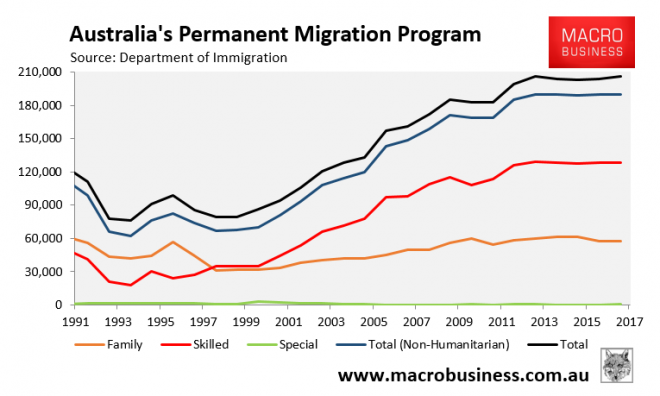 It’s not just foreign aid where Australia performing poorly, but also its immigration program. And the problems extend well beyond merely locking up refugees in offshore detention. You will note that the overwhelming majority of Australia’s permanent migration program are so-called ‘skilled’ migrants, which comprise some 62% of the total intake. Around 80% of these ‘skilled’ migrants come from developing nations, with most working in jobs well below their reported level of skill (e.g. driving an Uber). There is also widespread visa rorting and exploitation going on. By comparison, Australia’s humanitarian intake is comparatively tiny at just 9% of the total. Pu simply, Australia is running an anti-humanitarian foreign aid and immigration policy. nonsense – we give 100% of GDP to foreign aid……well, foreign rent-seekers/political donors at least anyway. It’s still foreign, aid, we just on-shore 200K foreigners p.a. before we throw goodies at them. Most foreign aid ends up lining the pockets of corrupt “leaders” anyway, so it just ends up being a virtue signalling headline number. This certainly seems to be the perception of the general voting public and is why very few seem to be kicking up a stink about this issue. Foreign aid should be spent on contraception and education in these countries. We can’t just keep relocating people ad infinitum at the financial and social expense of the locals. See yesterdays childcare payment Rort elevations by recent ‘refugees’. Don’t worry – Australia’s investing in contraception tech too – HSL (High Speed Lead) contraception! Pyneys’ warhouse – the lowest morals are just the beginning. e.g. That Band-Aid Ethiopia famine fund raiser was to help the population of about 40 million in 1984. They’ve recently had another drought (or climate change effects) with a population of over 100 million. These countries will always be disasters until they get their family planning under control. That would be the best use of foreign aid. Look up r versus k selection in evolution. Animals (inc humans) are more likely to increase offspring in stress and uncertain environments as a strategy, to compensate for increased mortality (not putting all eggs in one basket). Sure, there is cultural and educations factors at play that could be addressed, but the most effective contraceptive programs will be to lift people out of poverty and give them stability. That’s so primitive. Surely a rational person (i.e. not an animal) wouldn’t want to bring a child into the world unless there was a fair chance that child would have a reasonable life. Having children to perpetuate one’s genes is so base level Darwinian, sort of like neo-liberal economics. Having children to perpetuate one’s genes is so base level Darwinian, sort of like neo-liberal economics. Hang on, aren’t you one of the people worried about immigrants coming over and breeding out the “real” Australians ?
? maybe you’re confusing me with another Andrew. I am concerned with the sheer folly of overpopulation which here unlike Ethiopia is driven by immigration, but you’ve mis-attributed the real Australian sentiment. There’s certainly at least two, possibly three posters here called “Andrew”, so quite possibly. Apologies. Andrew; you are assuming that humans always act/behave rationally. That’s nuts. It’s who, what, everything we are. Disco fingers – that’s an excellent point. The Anglo Saxons from around 1720 to 1900, had probably the biggest population explosion of any race in history; humans have always tended to have around 7 kids per woman BECAUSE most of them die before 20, not because “they will get a decent life”. As soon as survival rates increase, that is when population “explodes”, it is not “increased birthrates” at all. Anglo Saxons were the first to increase their survival rates. Europeans generally were also the first to reduce their birthrates as survival rates increased and “a decent life” became more possible for the first time. The same thing tends to happen with other cultures. But one of the problems is that the higher survival rates due to modern medicine and food supplies (often by Aid) is not necessarily accompanied by the culture that led to economic growth and lifting of people out of poverty, in European countries and more recently Asian ones. So the larger numbers of kids surviving to adulthood are still not getting our decent life. Trouble is they want to come here to get the decent life but if they don’t leave the culture behind them, they will simply be aid victims in perpetuity (and social misfits and troublemakers) here instead of there – and what is “better” about that? It used to be. The US, in particular, has pulled back from aid that looks like family planning. Happens whenever the Republicans hold power. Need to keep the religious wackos happy. The rest of the aid world is so used to the US’s fickleness on family planning that I don’t think their furious stances against have a material impact. Anything else outside contraception and education is essentially futile. Reducing foreign aid does not lose a government votes. It gets them votes. No one cares about foreign aid. The general population will en mass say look after our own first. People voting for a party that reduces immigration is just an extension on that. Any government that increases foreign aid will lose votes. Australia has 148,000 on the public housing waiting lists and another 105,000 homeless. Every refugee family we house, pushes an Australian family further down the list. Well that’s plenty already, but if we want to make the percentages higher to boost the virtuousness feel, that can be easily achieved when the permanent immigration intake is reduced to 70,000, of which 18,000 might be humanitarian intake. Of course we should not be increasing the humanitarian numbers at all, the refugee resettlement program – that makes up approximately half of the humanitarian intake – is voluntary, and it should be abandoned. The funds allocated for the resettlement program would be better spent on the refugees in their countries and in the camps. Australian dollars, will help six times more refugees overseas than a ‘gold plated ‘ resettlement of refugees program in Australia, and will boost our national income devoted to overseas development assistance. Alternative view – we may give less in foreign aid but we are taking more foreigners into the country, which is a form of foreign aid. Interesting graph. As society became more and more atheist, foreign aid fell further and further. Not to mention, the rise of atheism has coincided with the belief that nothing should be done for homeless Aussies. In the past, flats were built to house the homeless and those flats still exist. AUS is cruel to genuinely skilled immigrants who have a disabled kid and deports them – while giving out Aussie passports to unskilled chain smokers who work here for $10/hour! Is Wade a liar or just effing ultimately stupid????? EVERY DOLLAR we spend on foreign aid we have to sell some Australian asset to a wealthy foreigner somewhere. Richer than ever??? What a stupid stupid statement. UE maybe you missed your own article this morning on our level of debt! Given that the government has muscled up the military-industrial complex as to increase the export of both lethal and non-lethal military equipment. Australia more then likely increase military aid then civilian aid. I for one don’t care where Australia sits on the “donor ladder” like it’s some sort of virtue signalling score board…oh, we are in the top 10…oh! where in the top 5… The West has been donating foreign aid for decades and still we are asked to do more and in 50 years’ time we will be asked to donate more and more. Why are the people who have a profile and a soap box (Politian’s, media personalities, reporters, commentators, celebrities, NGO’s) are so pious about every issue, every position that is taken on any issue you care to name, is always at the extreme end of Jesus Christ like morality? why these people feel that every Australian has to be the same, self-righteous citizens of the earth? Why can’t we keep our heads down, our mouths shut, work hard, keep a low profile on the world stage…and quietly go about building a strong nation, instead it’s all self-flagellation and… look at me !, look at me !. It is simply what the people wanted. On a national level I remember not so long ago everyone recoiled in horror about how much money we were sending to overseas nations. I guess the government cut it back after the uproar. On an individual level, you can’t be charitable when you have mountains of debt to service for the roof over your head, so you’re basically living hand-to-mouth in a million-dollar property. You missed the bit about 3rd world passport holders buying houses here illegally and the fact that real estate is excluded from the money laundering laws. Australians have been scammed too many times. It’s not going to be easy to reverse. Greens convincing Labor to lose control of borders has been deleterious to many many times the number of people it helped. No one should be surprised a Greens idea went to sht. Every cent of foreign aid should be in a single camp run by Australia. Forget giving money away. Forget increased humanitarian intake. Spend it where it’s most effective. Anything else is just BS feel good rubbish. haha I like that blip 2009-2012, Rudd/Gillard era buying the security council seat at the UN. They should both have the wealth confiscated. I have a foreign worker next door, said he hasn’t lodged a tax return for 3 yrs? Lot of upside there for us Aussies. Yeah but is he earning cash in hand or PAYG? If it’s the latter he’s probably overpaid his tax while thinking he’s smart. Hah! Does he have a 3rd world passport? Anyone able to tell me why we provide $300m of foreign aid to Indonesia each year? The latest Forbes indicates there are 32 billionaires there (in USD). It used to be part of minimising the influence of religious extremists. Then some bright spark decided that would never be of benefit. Thanks Smithy. I’m a little ignorant in this area. Do you mean the $300m p.a. (or $600m p.a. in earlier years) was essentially intended to be seen as a goodwill gesture (bribe?) to stop religious extremists from bombing us? Did it work? I’m not an expert by any means, just running from memory. It was mostly being put into schools, IIRC, as a counter to the Saudi policy of doing the same (funding schools) with an extremist islam slant.